Kerry-Liam has been the outstanding M35/M40 Scottish Veteran Harrier for several years. Only his M35 Ronhill Cambuslang club-mate Robert Gilroy seems likely to rival K-L’s achievements. Kerry has won: five BMAF titles (two cross-country, ten miles, 10k and 5k); 22 Scottish Masters championships; and nine SVHC. On August 16th 2015, he contested the World Masters marathon in Lyon, France, finishing fourth overall (3rd M40) after a truly valiant effort. He was first Briton and helped GB to team silver. 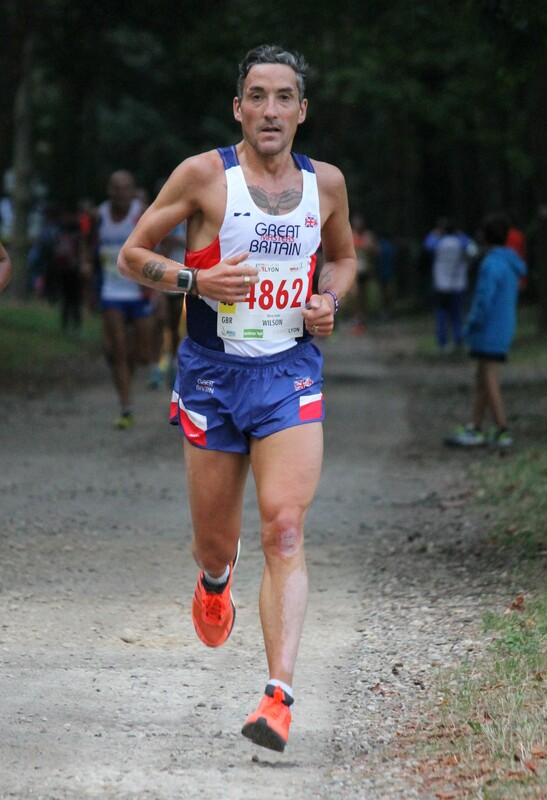 Now, as he has entered the M45 age-group, he is motivated to train for future European and World Masters events. Both Cambuslang stars run huge mileages in training. Kerry –Liam’s programme before Lyon was especially gruelling: three months hard, including six runs of twenty miles plus, and seven weeks of over 100 miles, with a maximum 131! Possibly a bit too much, even for an extremely fit 44-year-old. Once he takes just a little more care not to overdo it, and improves nutrition before and during a marathon, it seems very likely that a World or European Masters gold M45 medal is possible. No one could deserve it more. DATE OF BIRTH Some time during the 1970’s but not exactly sure. Being born in Singapore, a birth certificate isn’t something they gave out in those days. Youngest son Caine-Liam went along to the local football club under 7’s. However through time he just became a number, as the club got cliquey and, after I approached the coaches, I was basically told if I wasn’t happy then Caine wasn’t going to get a game. After that incident we were out a family walk and met Nat Taylor of Girvan AAC and, after he was told the above story his words were ” no matter how good or bad you’re at running, everyone gets a number” and invited us along to a training night. At first I was going along basically to keep an eye on Caine, as I didn’t want him doing anything wrong, and also wanted to see him happy after the football incident. A few sessions passed and I was asked if I fancied joining in with the seniors so, after a bit of juggling with Caine and his wee brother Kalle who was two at this time, when Kate worked a back shift, I went out with the seniors on a Tuesday and Thursday and enjoyed it. Whatever route we did on those days I would reverse it on a Saturday before finally get more involved. At Girvan AAC I would say it has to be Nat Taylor and Jack Maxwell, two coaches who went to races a lot and took me along and showed me the ropes. Did a lot of Sunday runs with Jack too and picked his brains when out on those runs. Caine would come along too if he wasn’t racing. Jack’s wife Eileen would look after him, usually in a coffee shop, before supporting us on the home straight of the races. At Ronhill Cambuslang it has to be everyone! There’s a good team camaraderie, which is a vital part of becoming and staying a winning club. At first it was Stevie Wylie. Jamie Reid and Michael Johnston later on, plus David Cooney, Colin Feechan, James Orr, Owen Reid and Robert Anderson. Stevie moved to Girvan when he bought a house, and we would do sessions and runs together all the time before his job went onto shifts, but we travelled regularly to races and, not long after that, I switched clubs from Girvan to Ronhill Cambuslang. On training runs again I would pick Stevie’s brains about running, training, diet etc, and then, after meeting Jamie Reid, would delve into his knowledge. Michael is another knowledgeable individual and I have learned a lot from him. Getting lifts from Michael after he spent a day working with athletes, he still gave me the time to answer questions I was concerned about. LIFE! When I’m training or racing it gives me time to search for things in life that I’ve never had. Gives me a focus and a meaning to be here! I get the chance to mature, be myself and be in a place I want to be, rather than somewhere worse where I have been before. Since I have been let down by many people throughout my life, running helps me to block out those dark times. Growing up without a father has made me more determined to succeed so that my boys can be proud of me. Anger can be channelled into races. Probably the Scottish Athletics Masters XC win at Kilmarnock in 2012 was my best win, with the way the race turned around at the front many times, before I made the break on the last uphill section. The only time I got my photo in Athletics Weekly. Also becoming the first person ever to do the clean sweep of all FIVE Scottish Athletics Masters National title wins during the Scottish Athletics Grand Prix Series in that same year, 2012. Winning the 5k, 10k, 10 mile, Half and Full marathons with PBs at 5k, 10 mile and half marathon. I was nominated twice for the Scottish Athletics Master of the Year Award. Hard to pick one out because, if you think you’ve had a bad one, there is usually a positive in there that can help you towards the next race. I’m one of the most negative thinking people you’ll find and always look at the worst possible outcome. Anything better on race day is a bonus. FIVE people help me tremendously, whether it’s during a meeting, before a race or by email/text conversation. They will remain anonymous but I think of them as: The Boss, The Champ, The Chauffeur, The Coach and The Gaffer. Without them I’d be the first to admit my performances at races would most definitely not have been what they were! I’ve the utmost respect, and owe them dearly for helping me, not only to get where I’m at in my running, but also to help me stay there. Just happy to be putting one foot in front of the other! Don’t do any other sports. Gave up cycling to/from work after consistently having ITB issues. Most strenuous “away from running” thing I do is a walk in and around Culzean Castle Country Park with the family, but after training has been completed for that day. Spending time with family. At first when the boys were young I was travelling the night before and sleeping at friends’ or family’s houses, but through time, with Kate changing jobs and getting a driver’s licence, we now go to races together, meaning not many nights away, unless it’s with the Masters squad for the International XC. One thing I’ve found that running has brought me is the friendliness of everyone, whether they’re from the same club or another club, although from time to time I still get questioned about why I left Girvan AAC to join Ronhill Cambuslang. Before I took up running I followed football home and away in Scotland and throughout Europe with my club and International team, causing mayhem and destruction to the body through alcohol. Once the boys came along this was curtailed dramatically, as the money I used to have pre-kids was now being spent on much more important things. During that time I was often hassled for wearing football club colours, but at running THAT will never happen, so I feel there’s a more secure feeling amongst the running network. It is excellent that I get best wishes and congratulations from other clubs, before and after races. Even during races the amount of people that spur you on is great to see. The National XC for example. I work from Sunday to Saturday for my week’s training. At my job I’m currently on a day shift/back shift rota with hours of 06:00-1400 or 14:00-2200 hours, so my training is around those hours of employment. Sunday will be the long run day. Depending if I’m racing the following weekend it can go between 16 – 20 miles. Normally around 1.45 – 2.10, again depending on race commitments and the route I choose. If in full marathon training I try and do 2 x 25 mile runs in my training schedule. Nowadays these are done on my own, depending how I’m feeling. If I’m feeling sluggish to begin with, and pick up during the run, I’ll turn it into a progressive session. Other long runs I’ll do 2 miles normal pace then do 1 x mile fast, 1 x mile steady x 8 then 2 miles normal giving me 20 for the day and try and have that in or around the 2 hours. Monday 05:00 hrs = 30 minutes to work, anywhere between 4.20 – 4.80 miles in length. Wednesday a.m. run the same, but the run home is a speed session, either a pyramid session or another type of interval workout. 5 x sets of 1 x 100,200,300,400,500 metres, all with 100 metres run through recovery in a pyramid style. 10 x 800 metres, 20 x 1 minute, 16 x 400 metres, 5 or 6 times a mile. Thursday and Friday the same as Monday/Tuesday. Saturday, if not working overtime, will be another session or easy run of 6 or 8 miles, normally, if racing on the Sunday. Sunday again will again be dependent on racing, but if I have not got anything on the radar, then another 16-20 will be run. Sometimes I might do a 22-24 mile run, just for the sake of it. 10pm is the 30 minutes run home from work. Tuesday : 12 noon = 8, 10 or 12 miles with similar times to the day shift week. Wednesday : either a session as stated above or the same as Tuesday. Thursday/Friday: same as Tuesday but, if racing, I tend to taper ever so slightly, with just 30 minutes to and from work. Saturday the same as last Saturday and again, if racing, an easy paced effort. Mileage can be around 75-100 miles but again, as stated, it’s all race dependent. In saying that, I’ve run 100+ mile weeks and been very close to my PB for that race distance. I’m like most people who work full-time, and who have to fit in training around the job, as it’s the job that pays the bills, not the running which, after all, is “just a hobby, really” – but a serious one! A good performance (2.31.01) on a hot day, although under 4 minutes slower than my PB. Mike said afterwards that the results looked good from where he was as, in an ideal situation, I’d have gone out at least five days before the competition to acclimatise. Took fourth overall but third M40 and GB wonTeam Silver. Two medals in my first ever Worlds can’t be bad, even if it didn’t quite go to plan. Winner was 2.28:42; second was M45 in 3.30:07; third, second M40, was 2.30:33. The M45 lad, I was with him from about mile 1 to mile 22. I took the lead at mile 24, but this was short-lived, for 300 metres, before winner and the M45 passed me. Was overtaken in the last 300 metres by the second M40, to leave me third. After first lap I was 20 seconds adrift, second lap 39 seconds adrift, third lap just one second adrift whilst working well with the M45. Stitch came from nowhere but in saying that, I took the lead during that period. Short-lived, as previously stated. Then the legs just got heavier and heavier with very little leg lift. What I did notice was the three guys all had energy drinks and the M45 had gels. I only had water from the official stations to use, in paper cups which wasn’t ideal. I remember missing the first water station too. Maybe a lesson learned there! The second M40 passed me and at that time the legs were getting heavier by the second and I knew he was closing me down but couldn’t respond at all. Lost toe nail again, same one as before. Legs stiff but I’ve been worse after previous marathons. Not doing any other ones this year and won’t make a decision until New Year about a Spring one. I thoroughly enjoyed the experience and already thinking of Portugal for the Non-Stadia ones, 10k or half there. Following year it’s the Stadia ones in Aarhus; then the Worlds again in Malaga in 2018. As for diet, I ate pasta the evening before. Didn’t have any at all in the week leading. Had chicken, tuna on the Friday night. Breakfast was three small bread rolls and two bananas. Energy drink and an SIS bar. Stomach sore with the stitch and I remember during Edinburgh the same happened. I feel fine over 10k or a half but, as in Edinburgh it hurt from 20-23 mile mark. Something again to ponder. One thing that was going through my mind while other guys were going to the feed tables was Nutrition! My psychologist does triathlons and she happened to ask if I took any nutrition on board during the race. At Belfast I just stuck to water. At Lochaber I had three coffees during breakfast to race start time, then Lucozade during the race. Warm conditions that day too but ended up with excruciating stomach pains almost forcing me to stop. I really enjoyed the whole experience in Lyon, even though it was just three days. I intend still do the Scottish and British races but will possibly aim for European or World Masters Championships as my “A” races throughout the year.